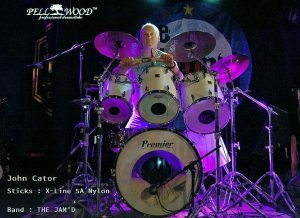 THE UK’s BEST KNOWN AND MOST AUTHENTIC TRIBUTE TO THE EXCITING LIVE PERFORMANCE AND SOUND OF THE JAM!! With brass section, keys and the only replica of Rick Buckler’s ‘Great White’ kit! Our next gig is Saturday 27th April in HOWDEN, YORKSHIRE! For more details CLICK HERE! For all the latest info, updates and gigs, LIKE our Facebook page. THE UK’s No.1 TRIBUTE TO THE LIVE PERFORMANCE AND SOUND OF THE JAM! With brass section and keyboards, see and hear the songs of The Jam on stage, from the early days right up to the end of 1982. Front man Dave Fletcher is sponsored by MOD SHOES who exclusively supply his stage shoes. Drummer John Cator is officially endorsed by PELLWOOD DRUM STICKS who exclusively supply his drum sticks. 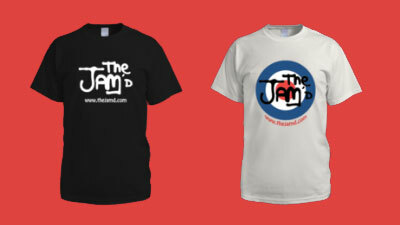 The Jam’d t-shirts available here. Different designs and different sizes for both men and women. Click here.